Taken from Cold Weather Crochet: "Variegated yarn can be difficult to use to show off a stitch pattern. 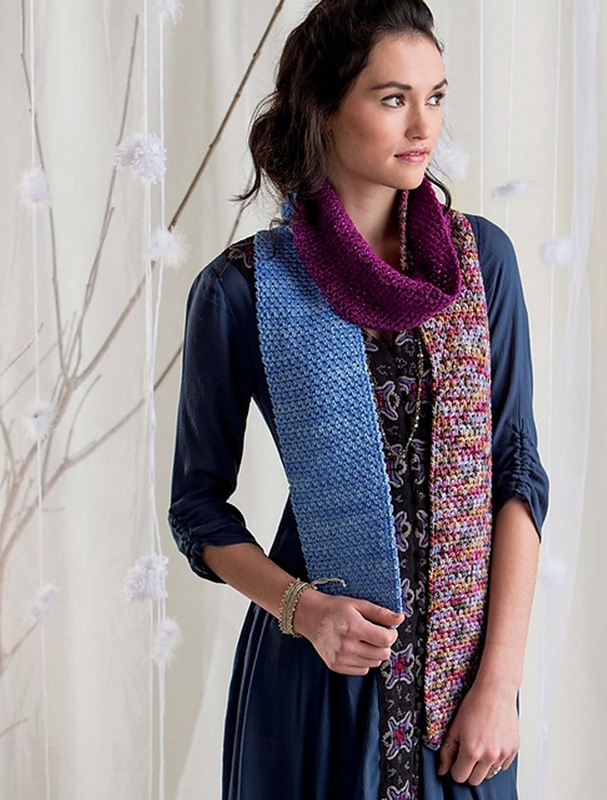 But by adding it as an accent to two semisolid colors, and then working linen stitch, the yarn not only shows off the scarf pattern, but adds a wow factor." This pattern is from Cold Weather Crochet, by Marly Bird. Size US I-9/5.5mm crochet hook (or size needed to obtain gauge), and a yarn needle are required but not included. Finished Measurements: 5" wide by 75" long after blocking. Gauge: 20 stitches and 16 rows = 4 inches in linen stitch. Colors shown: #32 Jewel Blue, #44 Geranio, #204 Velvet Grapes. If you do not see a color combination you like here, please contact our customer service department toll free at: (877) 529-5648 and we can help you create your own custom kit! $36.00 -- Kit price including yarn only (no book or pattern). If you like the Malabrigo Worsted Merino Linen Stitch Scarf kit, then you may be interested in some other kits covered in our Fall, Winter, Crochet, and Beginner collections.